12 volt, 1 batteries charged by: engine, shore power Currently only has one start and house battery together. 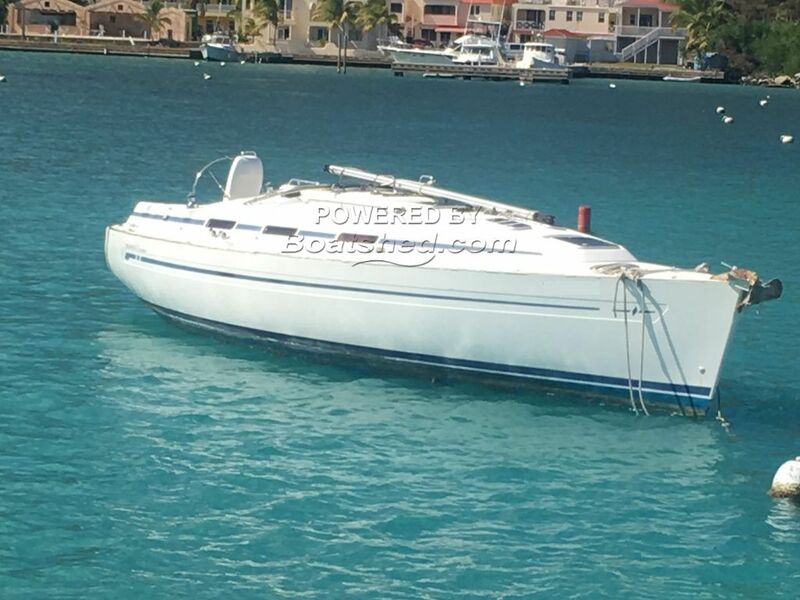 This vessel was in the water storage at an insurance recognised hurricane hole marina in the BVI. She never sunk, does NOT have any below water or topsides structural damage. There are a lot of scrapes, nicks and gel coat repairs will be needed. There is a new mast on island fully rigged with exception of the Forestay and furler. No foils for the forestay either. The doger frame work and all canvas from the boat are available. The sails are in fine condition. All new toe rails will be needed. Also needed are new Pushpit and pullpit. New bimini stainless frame. There was a lot of rain water up to the cabin sole for a short period of time, no higher. Boat has since been cleaned and dried inside. All electrics are good and functioning. Windlass will need some work on it to function, everything else has been looked over and functions. This Bavaria 36 Cruiser 3 Cabin has been personally photographed and viewed by Justin Smit of Boatshed BVI. Click here for contact details.